Boston Globe vs. B&N.com: Where is the future home for book reviews? 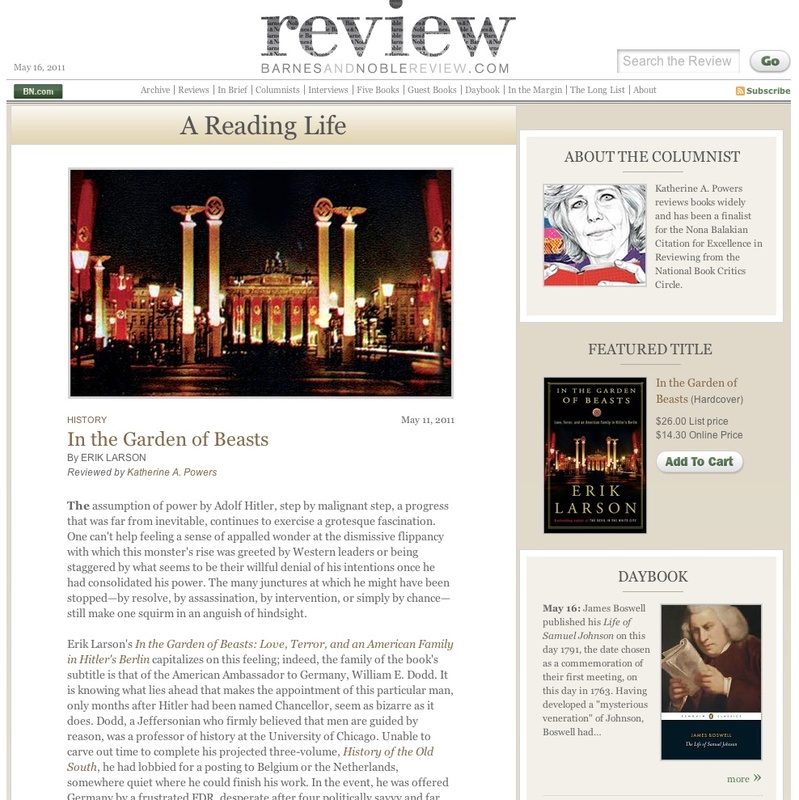 Earlier this year The Boston GlobediscontinuedKatherine A. Powersâ€˜s longtime literary columnÂ â€A Reading Life.â€ The column was later resurrected at The Barnes and Noble Review. Reading Powersâ€™s third column at her new home, aÂ review ofÂ Erik Larsonâ€˜sÂ In The Garden of the Beasts, it struck me how this moveâ€”ostensibly from a 100+ year-old, 21-Pulitzer newspaper to a glorified book chain blogâ€”was clearly a step up rather than down. For example, consider design. Powersâ€™s last column at The Boston Globe was a pitiful sliver of text surrounded by garish ads. Perhaps the print version redeems it, but at least in its online incarnation, there is nothing to suggest care or seriousness in the Globeâ€™s presentation. Boston Globe vs. B&N.com: Where is the future home for book reviews?, via MOBYLIVES.